Are you having fun with the giveaways?! We hope so, we still have lots to come!! Today we start giving away our fabulous Lemonade Stand collection! Bring on the summer!! Enjoy these fabulous layouts from our wonderful design team members! Don't you just love how they can mix and match with the BoBunny collections! When you have a Girl and a Boy you must to have much more photos of the Girl, right? At least this is my case. 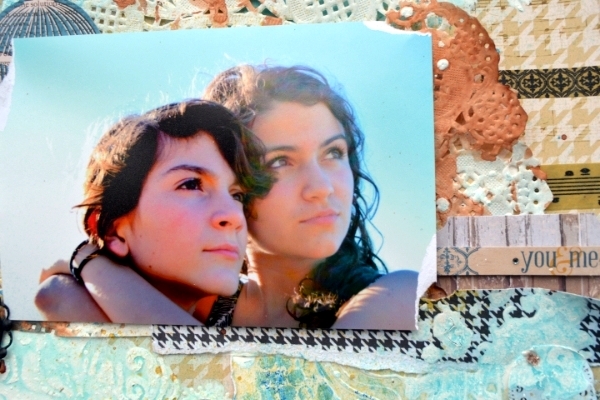 I really treasure photos with 2 of my children together. Vacation is always a good time to take lots of photos. This was taken during our last family trip last month and I liked it a lot. I also like to mix collection from Bo Bunny and this was a great opportunity to do it. You can find on my page several of them, I used Primrose, Happy Tails, Modern Miss, The Avenues and Zip-A-Dee-Doodle. I like to play with stencils a lot and I find a touch of gesso can in a very nice way "connect" different papers. You will get more united look. I have this photo that was taken of me and my little great-niece Kiera that I've been meaning to scrap for some time now. I wanted the page to be soft and feminine with a feeling of 'home' about it. For the soft and femine, I reached for the Primrose collection and for the home elements I chose to add in papers from The Avenues collection. I love the way pink looks with gold, so I chose the gold zig-zag paper from The Avenues collection as the matting for my background paper, and then I cut a pretty window/door design and clock from some of the other Avenues papers to add a 'homey' feel to the page. I love how the flowers from the Bo Bunny Blossoms Dahlia's pack goes with the Primrose papers! And that fabric bloom with the pretty button has to be among my most favorite blooms ever! As I was creating my floral cluster I added some cheese-cloth bits to give a more tattered look and finished it with the cute wood washer from the Primrose Button collection. For my title I used one of the ornate chipboard pieces from the Primrose 12 x 12 chipboard and added a few of the little banners underneath. I really love the 'Garden' paper for the beautiful and intricate labels on the back. Not only are they great for titles but the ornate designs can be cut and used as page accents in areas where you want to add a little more interest to the page (I did this on the left and right sides of the pink pink dot paper). 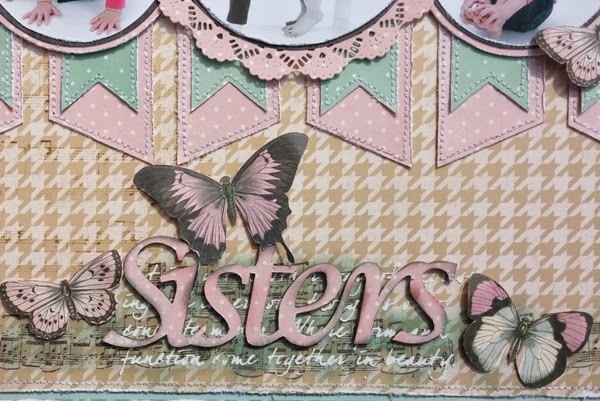 As always, I LOVE to use the butterfly paper for fussy cutting and adding whimsical accents to the page. I also did a bit of inking and stamping in the corners of my page, using the Bo Bunny 'It is Written Stamp', I then layered on a flourish design with a stencil and home made texture paste. 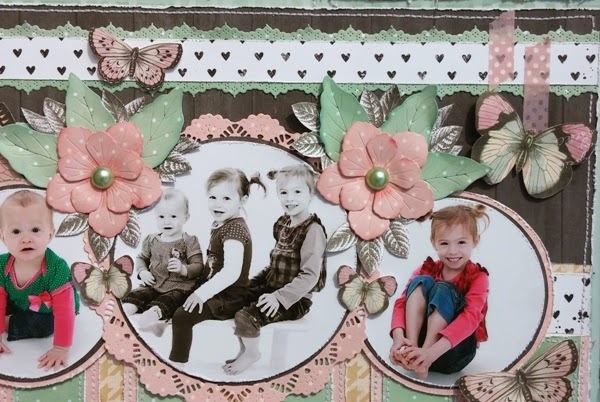 I love to scrap my sweet little nieces so this layout is all about them. When I was younger I really wanted to have a sister or two but I grew up with two brothers, it's not that I don't like having brothers but hey they will never brush your hair or girl talk to you *grin*. My sister in law went to a photographer to make these special pictures of her daughters they always put a smile on my face. For the bass of my layout I used the gorgeous Happy Tails sheet and stamped on the bottom part of the sheet I then used the music note stamp from the Autumn Song collection to match the stamping that's already on the sheet. Next I colored on top of the music note stamp to give it extra dimension and for the finishing touch I used a stencil. I really hope you are going to try mixing up all the pretty BoBunny collections. WOW! What great layouts, they're just beautiful. TFS! Great work! I've never had your class kits, but I'm loving the giveaway today! Great inspiration as always! Class kits are a hit with me. I love having all the pieces for a project ready-made since I have limited time to spend at my craft table! Wow looks like something I would love! Beautiful! Love Bo Bunny! 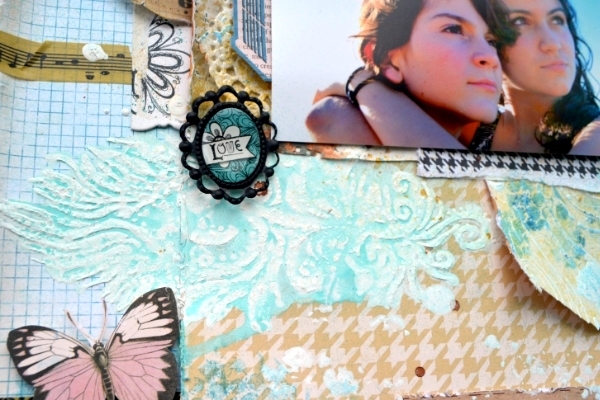 They always have a great selection of embellishments to go with their beautiful papers. Class kits are good if it's something I'm interested in making. Love these LO's today! So pretty! The lemonade colors are so bright and cheerful! These products would be a blast to create with! I love these layouts! They are all beyond fabulous!!! The LO's are truly beautiful. And the giveaway just screams summer! I have seen your class kits but unfortunately have never worked with them. I would love to however....maybe someday soon. Thanks for the chance at the awesome giveaway today. I have not tried a class kit. Would love to check them out! I love class kits. However, I've never used one before. the Lemonade Stand collection is so bright and cherry! It would have to be a welcome addition to any scrapper's stash! Another great post and giveaway! All of the layouts are absolutely gorgeous! Love the Lemonade Stand collection!! Great pages! I have never gotten to play with a Bo Bunny kit, but am sure I'd love it! This would go great with my daughter's pictures of selling lemonade, I love it, thanks for an opportunity to win. Fun colors! Lots of ideas. What fun summer colors. Lemonade stands are always fun to visit and the kids faces when you actually buy something is priceless. Love the bright colors of this collection. Amazing LO's and love class kits! Beautiful LO's, and I've never been to a 'class', but I'm sure the kits are awesome! Well BoBunny totes rocks so I'm sure the class kits do too! Love the colors of this collection! Your class kits seem great, unfortunately they are not available in Norway. Fun collection! And wonderful layouts!!!!! i would think anyone would love your class kits btw! Love the Primrose line! Just finished a layout with it myself. See I am going to have to buy more of these papers! Beautiful layouts! I love your class kits! Such beautiful layouts, love all the detail! These layouts have so many clever features! The kits make everything come together so smoothly! No class kits but looks like I need to remedy that. Beautiful pics....love those butterflies! Love the Inspirations you give us, I admit I have never used one of you class kits, but I have looked at them on your website and they look brilliant. Wow, what beautiful layouts, your kits are amazing, even though I have never gotten my hands on one, I sure would love to. I love your layouts! And I love, love the class kits! And I love, love , love Lemonade Stand!!! Beautiful. I really like the inspiration. Always love Gabrielle P.'s work, and the other layouts were pretty as well! Great pages! Love that collection. 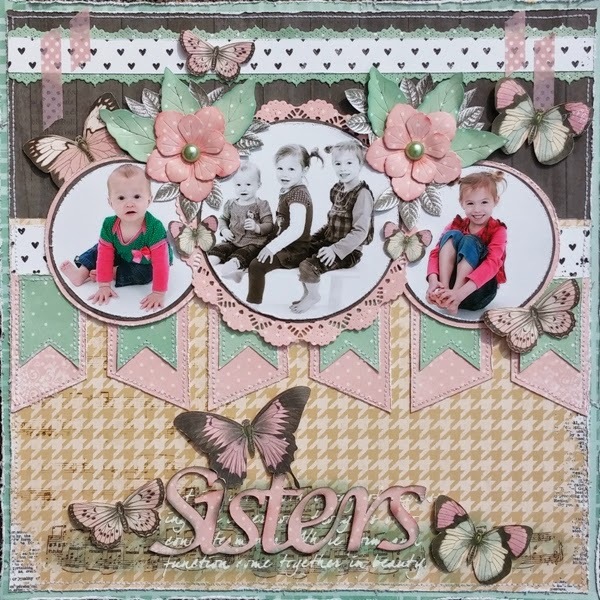 So scraplifting that sisters layout!! oh my Gabrielle layout is just amazing. I love all the detail, I wish,.....thanks for the inspirations. I love your class kits. Awesome layouts, especially the sisters one. Thanks! Love the layouts! I am definitely excited about the giveaway today too. This is my fave of the new lines. These are such gorgeous layouts! Love the one of Gabrielle and her daughter. Fabulous layouts!!! Love these colors! Beautiful page Gabrielle. Love the colour combinations. Gorgeous layouts! Oh, and love your class kits! Great layouts. I think my favorite is Gabrielle's. Love the pinks and the pop of green. I think the class kits are great. Love so much of your layouts and the BoBunny products! Thanks for the opportunities to win some of them, too. I love the class kits!!!!!!! I love the class kits!! I just made two guest books using Bo Bunny products. Getting ready to make some more. Love your stuff. gorgeous layouts! I love class kits, too. I've got to be honest here - I didn't know what a class kit was so I looked them up on your website. They were hard to find because they are not under Products, but under Projects within the Inspiration tab. So then I wanted to see how much they cost, but that's not listed. So then I see you have a Store Finder, but still no luck because your data is outdated for the 40031 zip code. Archiver's no longer has a store front & the other store listed has not carried scrapbook supplies for at least a few years. Do you see a disconnect here? Beautiful layouts! Love your class kits!! oh my, i love the new looks! Gorgeous layouts! So many beautiful details! The kits look fabulous! I love class kits!! They are so pretty and so motivating!! Just the thing I need to give my creativity a kick start sometimes. Wow! I wish I had the talent that these ladies have! The projects are just simply gorgeous!!! Thanks for sharing and for the chances to win! Love these layouts. Your kits look Amazing. Absolutely stunning LO's. Love the muted colors. 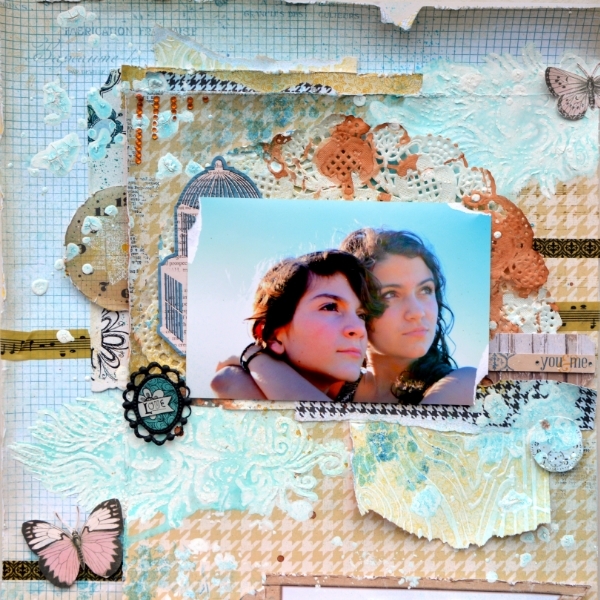 WOW - what WONDERFUL layouts - LOVE the colours, textures and layers!!! I LOVE your Class Kits!!! your kits are great, I love your mini albums they are just terrific! The kits are fabulous - having everything that goes together. Love the colors in Lemonade Stand. Love these colours!!! And the layouts! Good luck everyone!!! These layouts are gorgeous. Love all the beautiful details on each one. Everybody loves the Bo Bunny class kits!!! Love the Lemonade Stand collection. Who does not love class kits? Lemonade Stand is awesome!!! Wow, these layouts from the DT are gorgeous!! And of course, I love your class kits! The Lemonade Stand collection looks like so much fun! Oh my gosh, I love lemonade Stand!!! And who loves your class kits? Well I Do!!! Wow! These colors are so very pretty!! Great collection. Beautiful layouts, thanks for the giveaway! Awesome collection and I totally love BoBunny kits!! Beautiful collection ...love the layouts and Bo Bunny ! love the Lemonade Stand collection! It just makes me happy! Beautiful layouts, great prize package, would be thrilled to win the Lemonade Stand collection!!!! Just love it. Thanks for the chance to win. Oh these are simply amazing! LOvely collection it's a must have!!! Love your class kits! These are gorgeous layouts. Gorgeous layouts! TFS!! Love your kits too. Love Bo Bunny! Lemonade Stand with its bright n sunny colors n patterns is oh so wonderful for all ur Summer paper crafting. I am so excited to see this collection up close! Thanks for the chance to win some of it...definitely my favorite of this release! Lovely projects.....thanks for chance to win! I love the class kit...!!! I am in LOVE with Lemonade Stand! My little man adores yellow, even has a yellow hearing aid! I'll be watching for it at my local scrap shop! And I love all the class kits that have been shared recently! And the layouts from today... Wow. Just wow. Love your work ladies! Love the butterflies! 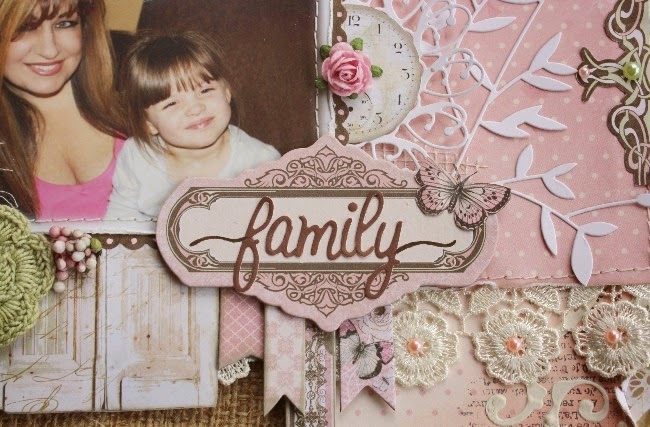 Inspired to go scrapbook today! Can't wait for this collection! Yummo!!! This is the collection I've been waiting for! Would love to win this!! I love class kits! Thanks for the inspiration! I love the class kits but I WISH I could get them in Austria!!!!! I love the class kits! The lemonade stand collection is so colorful and fun!! I love the super cute class kits! What fun I am going to have creating with The Lemonade Stand collection. So Pretty! You can never go wrong with butterflies - beautiful! I have the whole primrose collection from fotobella!! Would love to try a class kit!! I adore the Lemonade Stand collection!! It is so bright and fun! Love your class kits. Have bought several from EBay.